You'll find the Tikki Shop in the upmarket London suburb of Kew Gardens, a short walk (3min) from the KEW GARDENS underground station. Please click here for directions on how to get to Kew Gardens - it's simple when you know how! The London Overground	trains also stops at the Kew Gardens station. Bus number 391 very near our store, leave at "Lawn Crescent" or "Kew Gardens Hotel" depending on the travel direction. Main Line	trains stop at Kew Bridge station - this is a 15 - 20 min walk or hop on the 391 bus at the foot of the bridge. (pay Monday-Saturday, stay max. 4 hours). Parking is FREE in residents' bays on Saturdays. Parking is also FREE in residents' bays from Monday to Friday from 12noon onwards. Please note that parking is restricted in these bays from 10am to 12noon only. Please click here for maps with main roads & surrounding areas. PARKS - Walking & hiking - there are lovely footpaths along the river Thames, more details can be found here. Lovely walks to Richmond, Twickenham, Chiswick, Hammersmith etc. 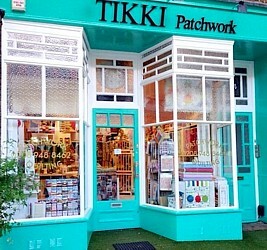 So, why not make the visit to the Tikki shop last all day by combining walking & visiting our lovely neighbourhood. Thank you for visiting and please come back soon again.